Making Connections: Ann Huff|! !| director of Madison Main Street|! !| left; and Vickie Hunt|! !| owner of Barkin’ Dogs Shoe Co. The rumors are true – since 2000, more young people with college degrees are moving into large cities than into their suburbs, both here in Georgia and across the country. What’s driving this trend, according to an influential study of urban revival, is more than just wanting to avoid grinding commutes or delaying starting a family. These young professionals want to be close to restaurants, shops, theaters, museums and parks. That’s why you always hear the term “live, work, play” thrown about when talking about fostering a sense of community, whether that’s in the form of a new mixed-use development or the revitalization of an existing historic downtown. But on the local level, a fourth word – connect – is where a number of Georgia’s small downtowns are staking their claim. They have a big advantage: an authentic sense of place. And it’s why many are seeing the same trend as the country’s largest cities despite encompassing far fewer city blocks. At the forefront of rebuilding strong downtowns is the Georgia Main Street Program, which helps communities revitalize and strengthen their central business districts through economic development tied to historic preservation. More than 100 cities across the state participate in the program, which is housed in the Office of Downtown Development at the Georgia Department of Community Affairs (DCA). Sixteen have achieved Exceptional Main Street status (GEMS), making them the best of the best. As people move back into cities, they’re bringing with them the desire (and expectation) for walkability, good design and access to amenities. Historic downtown buildings, existing infrastructure (streets, sidewalks), a deeply rooted identity – these things give downtowns a leg up. But those historic structures can also be a bit of a challenge when it comes to getting people to move in with their modern lives. Having a mix of residential options – including retail with residential on top – is key, says Monica Callahan, planning director for Madison. “Before the last 20 years, downtown was all but vacant of residential, and we’ve been reintroducing that in different ways,” including changing zoning ordinances to allow shop owners to live above their businesses, she says. And in the area surrounding the downtown core, homeowners are permitted to have a business in their home. Callahan says it’s a true live-work model that’s a new version of the old-fashioned shopkeeper’s approach. For Vickie Hunt, the old adage that retail follows rooftops was literally and personally true. Hunt owns Barkin’ Dogs Shoe Co. in downtown Madison, but that’s not the reason she lives where she can walk to work. Rather, the reverse is true. Hunt moved to Madison in 2007, rented a house downtown and promptly fell in love with “the whole idea of being able to walk to restaurants, shops, the park,” she says. A year later, she bought a loft in a historic building across from New Town Park that features shops on the bottom and condos upstairs. And then she decided to open a store herself, on Main Street. Hunt’s condo is emblematic of Madison’s approach to balancing the creation of new residential side-by-side with (and sometimes in) historic buildings, what Callahan calls context-based design. Anything else isn’t really an option in Madison, whose economy relies on heritage tourism. “They’re coming to see historic preservation,” Callahan says. According to the DCA, that’s a smart approach: The communities whose downtowns do best at attracting residents, visitors and economic development have a clear focus on historic preservation – along with stable leadership and a clear plan. Downtown Woodstock might seem far away from Madison, but the same is true in this Metro Atlanta suburb. Residential options include apartments, townhomes, single-family houses and retail on the bottom with residential on top. And just like in Madison, it looks like it belongs all around a walkable downtown. “When we do have new developments, we’re very strict,” says Mitzi Saxon, downtown program manager and COO for Main Street Woodstock. She credits good relationships with city leaders, including the mayor, city council and downtown development authority, as being crucial to getting the residential mix right. It’s the same story in many of the historic downtowns: Adapting old buildings for modern life (lofts, condos) and adding new ones that work in a downtown environment are luring residents back. And it’s not all millennials, though Saxon says they are probably the majority in Woodstock – the city just added a bike-share program that appeals to people who don’t want to get back in the car once they get home from work. But she says seniors, too, like living where they can walk to restaurants and shops. In Madison, it’s not uncommon to see grandmothers pushing strollers around downtown sidewalks. Ann Huff, director of Madison Main Street, calls it the in-law effect. While Madison has long appealed to retirees, now baby boomer parents are choosing to move closer to their grandkids, and they like living downtown. “People move to a smaller community to raise their children, and then their parents follow,” Huff says. 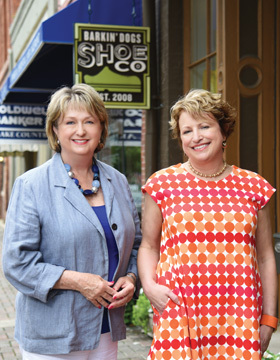 Thriving downtowns draw residents because they don’t close up shop at 5 p.m. “If you have a downtown that opens at 10 and closes at 5, there’s only so much you can do,” says Carlee Schulte, Main Street/Downtown Development Authority executive director for Milledgeville. That’s not an issue for Milledgeville – because it’s a college town (home to Georgia College), during the school year the sidewalks never really roll up. “We’re closed from about 2 to 6 [in the morning], but other than that we have things that are open and active between coffee shops and the bookstore all the way to bars,” says Schulte. The students – and faculty – are the heart of downtown. Schulte calls them a built-in customer base. But so are the people who work at the city and county offices and at four bank branches, all located downtown. “It’s important to have community businesses that are pretty large employers stay downtown,” she says. For towns that don’t have built-in revelers, holding regular events benefits both local merchants and residents. Woodstock has a themed Friday Night Live once a month (shops stay open late) and a series of bluegrass concerts on Thursdays in the summer. Saxon says it’s popular with young families and older residents. And even in Milledgeville, the city uses the summer months to appeal to its permanent residents with First Friday events. In Thomasville, events do double duty, pulling in tourists for big ones like the Rose Show and Festival in April and Victorian Christmas. But residents can choose from nearly 500 events held downtown in the last year alone, says Main Street Director April Norton. “In the beginning, [we wanted to] bring them into downtown and develop our small businesses, retail and dining,” she says. Thomasville has more than 80 retail shops and about 20 restaurants, according to Norton. Now the goal is to manage the flow so downtown appeals to both visitors and residents. A newly constructed amphitheater hosts concerts and lunchtime events – the latter designed to draw residents and workers, and provide that all-important sense of place. More and more, downtowns are leveraging social media to let residents know about events and even just the benefits of downtown life. Thomasville promotes its hundreds of events through Facebook and Instagram and encourages its merchants to offer specials and different entertainment options that are tied to the events. Downtown Thomasville’s Facebook page has more than 10,000 followers (the city’s population is about 19,000). There’s also a “This Week in Thomasville” email that lets people know what’s going on. Everything drives back to the website where people can get the details about an event and see a month-by-month calendar of what’s coming up. You’d expect that a college town like Milledgeville would embrace social media. But it’s bought into the idea that residents are the ones who can really get the word out. When the program won the Great American Main Street Award in 2014, it created a logo and asked residents to share their love of the city and downtown by tagging their Twitter, Facebook and Instagram posts with #ilovemilly. It was quickly adopted – just search the hashtag I Love Milly and you’ll see plenty of pictures and posts about events, shops or just fun times in the city. It started with a question from a new business in Madison, a DIY wood sign workshop called Board and Brush Creative Studio: Could it serve customers a glass of wine as they worked on creating their own works of art on wood? At the time, only restaurants and caterers were allowed to serve alcohol. But as downtown shops, from art galleries to bookstores, focused on offering customers experiences as well as inventory, it was a way to broaden their appeal. That question led the city to establish an arts and entertainment district overlay right in the middle of the central business district. There, shops like Board and Brush can serve up to two glasses of wine (provided they have a state license to do so) – but so can beauty salons and spas, art galleries and theaters. “Retailers like to do promotions,” says Ann Huff, director of Madison Main Street.